Zazzy, an Amsterdam-based startup that allows anyone to design and customize their own 3D-printed jewelry is now launching a new marketplace that lets you sell your jewelry to others as well, instead of just buying it for yourself. The company believes the new platform, Zazzy.co, will make sense for artists and designers looking to expand their portfolios, as well as for others, including marketers, bloggers, tastemakers, and more, where it can serve as a way for them to add to their own collections of branded merchandise. For those unfamiliar, Zazzy.me was founded in 2013 by Gert Jan Spriensma, one of Distimo’s (acquired by App Annie) first employees whose background is in industrial engineering, along with Martijn van der Veen, a UCL grad who studied A.I., computer vision, and graphics. 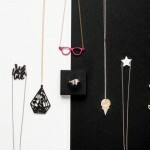 The company has seen over 60,000 users design their own necklaces, bracelets and rings to date. And in total, its customers have created over 200,000 designs since the platform debuted. On the site, customers use simple tools to select their jewelry and materials (e.g. gold-plated shiny steel, stainless steel, matte black steel, nylon, etc. ), then create their designs using lettering and icons. Zazzy doesn’t actually do its own printing in-house, however, but works with multiple printeries around the world, including exOne and Shapeways, for example. Ship times vary, but most customers receive their products in two to three weeks, Spriensma says. The marketplace is actually launching at the end of the month, he also notes, but is available for preview here. Zazzy is currently backed by half a million in angel funding from a number of investors, including angels who founded companies like eBuddy, Freedom of Creation (acquired by 3D Systems), Hyves and Vakantieveilingen. Spriensma says Zazzy is now working to pursue some opportunities in the U.S. and the team is planing to move in the next six months.